There was an air of nervous anticipation in the days leading up to the Junior Cert results in St. Aidan’s which was quickly replaced by one of delight and relief. The students worked hard and this was evident in the results they received. Teachers and parents alike were thrilled to see so many rewarded for their efforts as they reached their academic potential. Special mention must go to Orla Clerkin who achieved a perfect 11 out of 11, a feat only achieved by a mere 125 students countrywide! Results were very strong with subjects including Maths, Home Economics, Science and languages well above the national average. 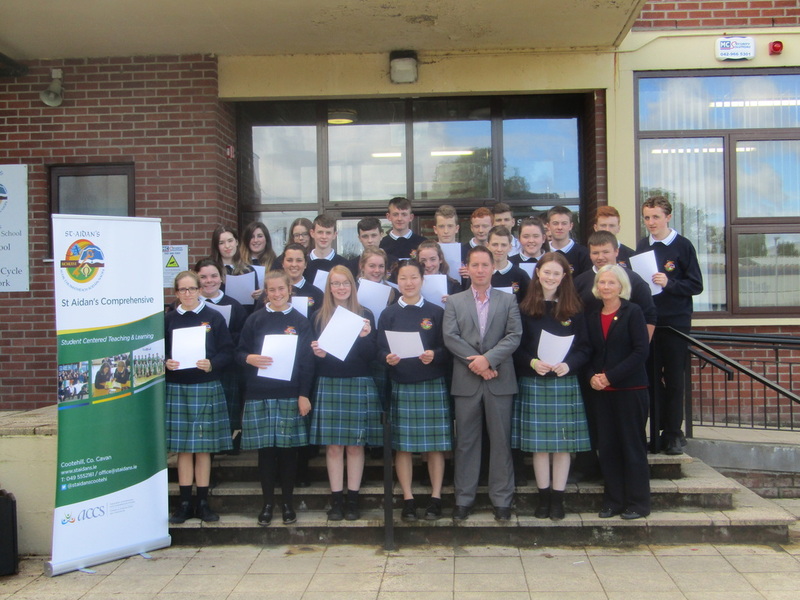 The mentoring initiative introduced by Deputy Principal Niall McGee played a vital role. It allowed teachers to give valuable one-on-one support and guidance to students in 3rd and 6th year. Four annual meetings with students and their parents enabled specific goal/target setting which was key to helping exam students stay focussed and on track to achieve to the best of their potential. Pictured are Principal Maryann Smith and Deputy Principal Niall McGee congratulating Orla Clerkin and some of her classmates on their terrific results. Well done to one and all from all the staff in St. Aidan’s Comprehensive School!